Regulation of lipogenic gene expression by AMPK. (A) Gene expression of lipogenic enzymes was measured in isolated primary hepatocytes from control and L-ROCK1–/– mice fed a normal chow diet treated with compound C (n = 5–7). 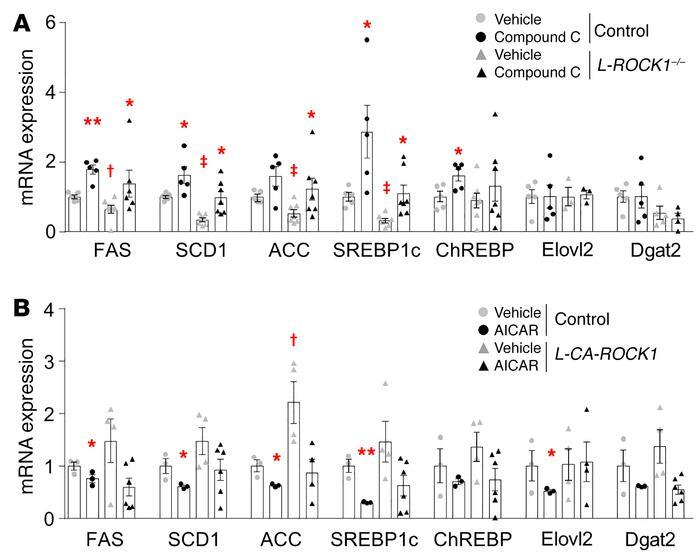 (B) Gene expression of lipogenic enzymes was measured in isolated primary hepatocytes from control and L-CA-ROCK1 mice fed a normal chow diet treated with AICAR (n = 3–6). Mice were studied at 8−9 weeks of age. Values are means ± SEM. *P < 0.05, **P < 0.01 vs. vehicle, †P < 0.05, ‡P < 0.01 vs. control by ANOVA with Fisher’s PLSD.